Puerto Rico has been in the news lately, particularly the financial news. The possibility that its government may default on part of its $73 billion public debt has drawn the attention of Wall Street analysts. The New York Times has deemed the situation worthy of several editorials. More often than not, the island is offered as a yet another lesson on the consequences of “big government” and of too generous social provisions. Other factors are rarely mentioned–such as the tax privileges of U.S. corporations, or the potential consequences for working people of the austerity measures under consideration. 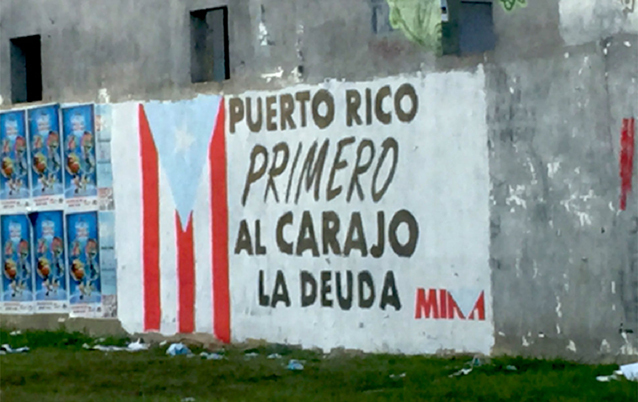 Graffiti in Trujillo Alto, Puerto Rico. It translates: “Puerto Rico first, to hell with the debt.” Photo by Ed Morales. The perspective of Puerto Rico’s creditors has been expressed most openly in “For Puerto Rico There is a Better Way,” a report commissioned by the Ad Hoc group, which includes close to 40 investment funds that hold part of Puerto Rico’s debt. The document argues that Puerto Rico’s public debt should not be renegotiated. It should be paid in full. To enable such payments it proposes closing schools, reducing public employment, lowering salaries and pension benefits of government employees, privatizing government agencies, selling off state properties, and limiting public health insurance coverage, among other measures. Unfortunately, creditors have more often than not imposed their narrow policies, with dire consequences. They do so through the threat of both market and legal retaliation (denial of further credits and litigation to collect owed payments). But according to Stiglitz, the capacity of creditors to impose their terms does not only block the efficient resolution of debt crises when they arise–it promotes their emergence to begin with. Creditors, confident that they will recuperate their investment (through litigation if necessary), lend when they should be more cautious. Such was the case with the $3.5 billion Puerto Rico bond issue in March 2014, just after the government’s credit rating had been degraded to speculative or junk level. Governments, conscious of the difficulties and the political cost of seeking debt restructuration, prefer to borrow more and pass the problem to a future administration. This is what successive administrations did in Puerto Rico. In order to do so, argues Stiglitz, governments agree to ever higher interest payments and further concessions, such as the litigation of any disputes in U.S. courts. This is what happened in Puerto Rico. Finally, the foreseeable success of creditors in the courts invites the intervention of vulture funds. They buy distressed bonds at a discount price and seek payment at their nominal value; their business depends on debt renegotiation failing or being insufficient. This is also the situation in Puerto Rico where at least 25%, and perhaps as much as 50% of the debt has been acquired by hedge and vulture funds. In Puerto Rico, this debt-promoting machine had an additional lever: the exemption of its bonds anywhere in the United States from local, state, and federal taxes.